Come and enjoy a feeling of absolute freedom! 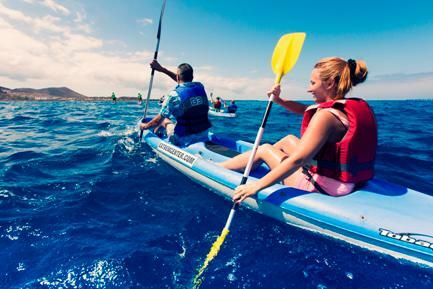 You will paddle to the foot of the majestic cliffs of the Montaña de Guaza, reaching the beach of Los Cristianos. During our tour, we will approach to a permanent colony of dolphins in the marine reserve, that you can see during the 90% of our tour. The tour duration: 2,5 hours. After a short introduction on how to drive a kayak, safety and procedure of our excursion we will paddle out – along the picturesque coast line, past fish farms and hidden bays. Our goal is the small and original fishing village of El Puertito. Here you have the possibility to enjoy a refreshing bath in the clear Atlantic water and see the resident ocean turtles. The Tour starts in Playa Paraidso (transfer included). The Tour duration: 3 hours. WARNING: Kayak Tours are not scheduled and it always depend on the number of participants. If you want to participate in the Kayak Tour, please, inform us about desired date of the Tour, so we will arrange it for you this day or nearest possible to the desired date. If the Tour would not be available for the desired date or, if you are experienced kayaker and want to paddle independently without a guide, you can always rent a kayak and do your own trip. SEA KAYAK TOURS starts from Los Cristianos, Palm Mar or Playa Paraiso and are not scheduled – we will always ajust you a kayak tour to your desired date. Please, choose the desired date while booking. 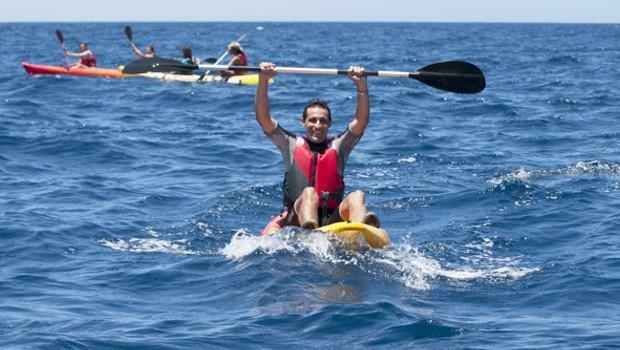 In order to make your booking of SEA KAYAK Sea Tours easy and comfortable Tenerife Host use the most advanced and user friendly booking platform TripsPoint.com where you can easily check last actual prices, the tour availability, required booking deposit and book this tour. To get more information of SEA KAYAK Sea Tours and do booking, please, click the button ‘Book Now’. You will be taken to the tour page at TripsPoint.com where you can easily book the tour. Once the booking of SEA KAYAK Sea Tours made at TripsPoint you will get your tour Voucher / booking confirmation with all details, including exact pick-up point with pick-up time and map. 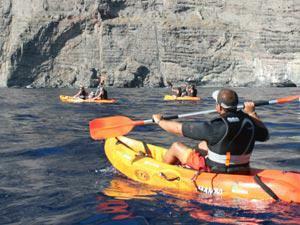 15€ – Single Kayak per 1 hour. 20€ – Double Kayak per 1 hour.